The HydroCarbon Profiling (HCP) approach offers a way of separating and counting fuel components and their impact on combustion in more detail. The HCP approach is linked to the chemical bonds weighted by thermodynamic parameters such as combustion enthalpy and the bond dissociation energy. This approach has been presented in North America during DEER, SAE congress or San Diego’s CRC conference, in Europe and Japan since 2007 in front of a large panel of worldwide engine experts. 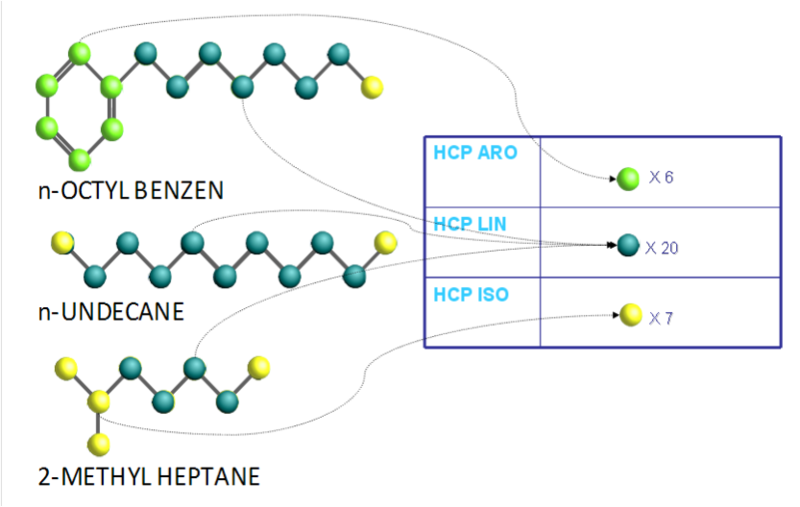 The figure shows how it is possible to easily calculate HCP values from a hydrocarbon fuel made of three different molecules. The molecular information contained in the NIR spectrum is extracted and turned into HCP data using advanced mathematics and deep understanding of fuel. The absorbance of the fuel NIR spectrum is measured in zones having the considered wavelengths. The values of absorbance measured for each selected wavelength are introduced into a mathematical model previously calibrated on a reference database, according to the known Chemiometrics rules. This information allows calculating the molecular structures of the fuel. For now 2 decades, more and more publications can be found about fuel composition impact on the holistic system defined by the thermal engine. Hundreds of papers are published during major events, worldwide conferences and seminars (SAE, JSAE, FAD, DEER, CRC...) about the impact, the benefits or the penalties of co-optimization of the engine & the fuel. Since the injection, combustion and after treatment systems are affected by the fine chemistry of the fuel. The proposed solution consists in monitoring the number and weight of the different chemical bonds to give a detailed description of the fuel. Such level of detail is given by the HydroCarbon Profiling (HCP) approach (SAE 2007-01-1830). 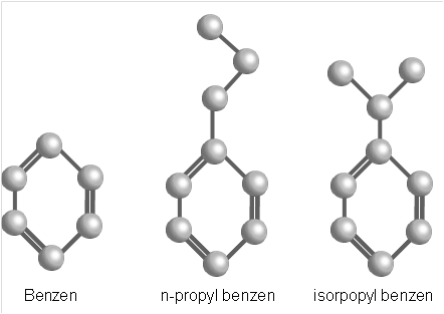 However, as shown in the figure, those molecules combine three chemical aspects: the Aromatic, the Iso-parrafin and the n-Paraffin. They are all classified whithin the same Aromatic family according to the standard GC method. PIONA analysis results for these three molecules will be 100% Aromatics. The behavior of those components during the combustion is different. So the common and standard classification method does not provide sufficient information to understand combustion in details. The HCPs have been designed to explain in detail the fuel behavior and its impact on injection, combustion and post-treatment. For instance, self-ignition delay of a gasoline is increased when HCP_Iso-paraffin is high and decreased when HCP_n-Paraffin is low. The self-ignition delay of the fuel is a combination of the different HCPs. 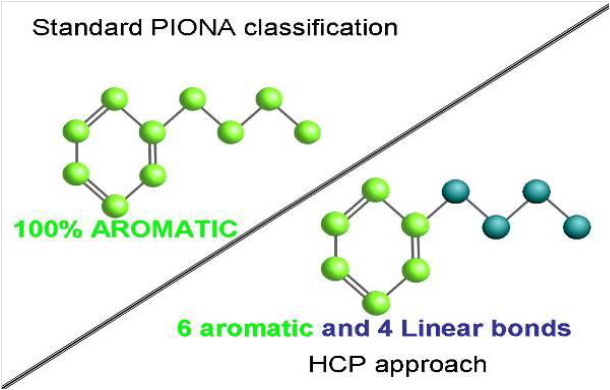 This new figure illustrates the difference between HCP and standard PIONA approaches. The HCPs offer a way of separating and counting the fuel components and impact on combustion into more details. While the standard GC approach classifies n-butyl benzene in the aromatic family, the HCP approach highlights both the aromatic and the linear characteristics of this molecule. The different reactions (radical’s formation) during the combustion process are explained by weighting the HCP with thermodynamic parameters (Patent WO2006100377 - Method for optimizing operating parameters of a combustion engine - SP3H, A. LUNATI, J. FOURNEL).